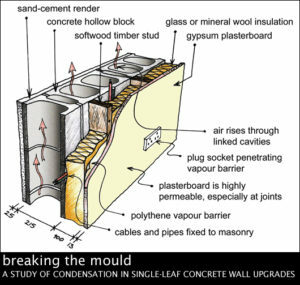 Industry expert and BReg Blog contributor Joseph Little published an informative series of articles in Passive House + magazine in 2009 on mould growth, ventilation and condensation problems in buildings. ‘Sick building syndrome’, consequent occupant health problems and long-term damage to building fabric are issues that have long affected Irish construction. Due to technical conflicts and deficiencies in our current building regulations, specifically for ventilation, many experts consider ‘sick building syndrome’ to be the next potentially widespread defective issue facing the building industry; the next ‘pyrite’. Inadequate technical knowledge, ‘traditional’ detailing coupled with poor workmanship particularly in the speculative development sector are at odds with more technically demanding building methods such as timber frame projects. Timber frame has the potential to be a viable and efficient way to accelerate projects off-site, but requires a high level of precision not only in design, but also in execution and workmanship on site. ‘Design and build” procurement models where the builder/developers are contracted to provide design, build and certification of projects has been a major problem in the past with very poor outcomes. The industry awaits a government audit into a number of so-called ‘rapid’ build timber framed schools completed less than 10 years ago which have been plagued by serious building defects. Timber frame estates figure prominently in lists of known defective residential schemes. Our current privatised system of building control involves very little state involvement and scant enforcement of standards. Remarkably bulding certifiers can still be direct employees of contractors and developers. Despite onerous and costly administrative procedures introduced in 2014 the occupant and purchaser still have little or no legal rights in the event of mould and condensation problems arising in new homes. The following series of 5 technical articles by Joseph Little are well worth a read; we have included links to each complete article along with the respective executive summary. Designers and builders need to build with far more awareness of moisture movement. We need to build resilient systems – be that a wall, a ventilation system or the building itself. We need designs that can accommodate things going wrong and can ensure structure and the occupants’ health are safeguarded. The only answers are more education and understanding among designers, more understanding and care among builders, and a better selection of materials. In some cases it may mean clients need to pay more, in others no cost difference: but the pay-off for their health should be clear. “Making the right choice… Financial cost is always an issue in Irish construction projects and can only increase in significance in the current straitened circumstances. This is only right, but our plea to homeowners embarking on an energy-efficient upgrade is that they would give greatest weight to long-term value, long-term costs and long-term benefits. A great example of this can be seen in the comparison of drylining and external wall insulation. Most forms of drylining are cheaper to install on ‘day 1’, per square metre of prepared surface, than external wall insulation. While this article has discussed in detail hidden long-term costs that must be considered, such as the dependability of the thermal upgrade, mould potential etc, there are also other hidden financial costs. Drylining requires that occupants move out and rent or stay elsewhere, that they put furniture and paintings etc in storage (even if still on site) and re-decorate after. External wall insulation on the other hand requires that scaffolding be erected (some external wall insulation installers do this: some leave it to the general builder). For a proper installation with minimum thermal bridging, windows should be unfixed and moved to the outside line of the original wall, drainpipes should also be moved out, roof eave fascias need adapting and any concrete paving surrounding the house should be cut back to ensure the insulation clads the full height of the relevant external walls. This may sound expensive, but that view may be countered by the shorter construction time, the fact that the occupants can often remain resident, and the fact that the only re-decoration needed inside is the cladding of the widened internal window reveals with timber liner boards. However the final, and perhaps most persuasive hidden cost in this comparison, may be the remaining size of the house. “It is still not clear to the author, or to many others, why Agrément certificates with the current level of detail are supplanting a wide number of excellent ETAs in relation to EWI for use under the HES scheme. We want clever systems, more choice and good prices. Besides references to Irish regulatory standards and codes, Agrément certificates do not appear more detailed or ‘local’ than ETAs. If the case for local and installed value is to be convincingly made Agrément certificates need to be more useful to installers and more specific to Ireland by referencing a wealth of local information, such as the impact of severe weather conditions on the system assessed, and information and issues that will impact upon performance. It would be very useful if they could, for instance, allow easy calculation of Psi-values and provide equivalent details to the ACDs for that construction system. In the context of climate change… A key part must be integrated guidance, another must be wide access to good products. It will not be easy but working together we have a good chance of reducing the carbon emissions of our housing stock to zero, not by 2020 but perhaps by 2035, and creating a large number of jobs and a more sustainable society in the process. A reasonable understanding of the scientific units, material data and the vapour mechanisms involved is necessary to use the software and to understand if what is being outputted reflects a mistaken initial input or a key finding. Software with a good user interface, an extensive help file and an online forum, such as WUFI Pro has, will do a lot to guide and educate the user. They also have courses: the first English language course in using WUFI was delivered last year in the Fraunhofer Institute in Holzkirchen, near Munich. This writer attended. However courses have been run in various European countries, North America and Japan for many years. Alternatively you may wish to visit the WUFI website <http://www.wufi-pro.com/> and download the free trial version of WUFI. Author Joseph Little is expanding the range of services his environmentally-focused architectural practice provides to now include technical support to other designers and builders, starting with thermal bridge assessments. Visit ‘Building Life Consultancy’ at www.josephlittlearchitects.com for more info. Part L | DECLG slowdown: Better building or more red-tape? This entry was posted in Building Regulations on September 15, 2016 by BRegs Admin.